‘The greatness of a nation can be measured by the way its disabled are treated.’ Fidel Castro spoke these words in December 1989, 10 days after the invasion of Panama by the United States. During the Christmas holiday of 2017-2018, we visited Cuba. A colourful journey. Of the roughly 11 million Cubans, 65% consider themselves to be white; around 25% are of Afro-Cuban descent, and 10% are black. The native Indian population has long since merged into the other population groups. Cuba is the biggest Caribbean island and its history is long. Until the end of the 15thcentury, Cuba was inhabited by Indians. In 1492, Columbus discovered the island, which became a Spanish colony in 1512.The Spanish ruled for over three centuries, when the port of Havana played an important role. The gold and silver from South-America was transported to Spain through this port. In the late 19thcentury, the Cubans, assisted by the Americans, rose in rebellion, and Spanish rule ended. In 1898, following the Spanish-American war, the country was conquered by the United States, after which its formal independence was a fact in 1902. This independence, however, did not result in a lessening of American influence. In 1952, the continued interference was cause for the first revolution led by Fidel Castro. The revolution failed, but on the first of January, 1959, Castro took over power in Cuba. Cuba, Havana. Che Guevara on a MinisteryIn 1962, the conflict between the capitalist United States and the communist Fidel Castro led to the Cuba Crisis. Fidel, with his communist ideas, sought help from the Soviet-Union. Cuba lost its most important ally when the Soviet-Union fell, and the Cuban economy collapsed. The crisis was intensified by the American trade embargo in 1960. The country is still suffering from the effects of this embargo, which is still being enforced in certain areas. President Obama partly cancelled the isolation, resulting in opportunities to develop for Cuba. The Cuban concern about free trade and free travel has increased since the inauguration of president Trump. Not surprisingly, we did not meet any Trump-sympathisers in the streets, but we did meet many people who spoke highly of Obama. In 2008, Raoul Castro, Fidel’s brother, became president of Cuba. The conversation about Cuba never ceases to interest us. Whether it concerns the ‘open-air-museum-feeling’, the American embargo or Fidel, there are many different opinions. The strength of the country’s own voice seems to be dependent on the political colours of the country. Whatever the opinions, when we look at its educational system, fact is that Cuba has an exemplary function, as indicated by UNESCO in its Global Monitoring Report, in which Cuba is described as an example for other countries, especially concerning the education of vulnerable students. Education in Cuba is one of the most important fruits of the revolution. Before the revolution, education was only accessible for the rich, but since the beginning of the revolution in 1959, the government has been spending 10% of its total budget on education, compared to 6,3% in The Netherlands in 2015. 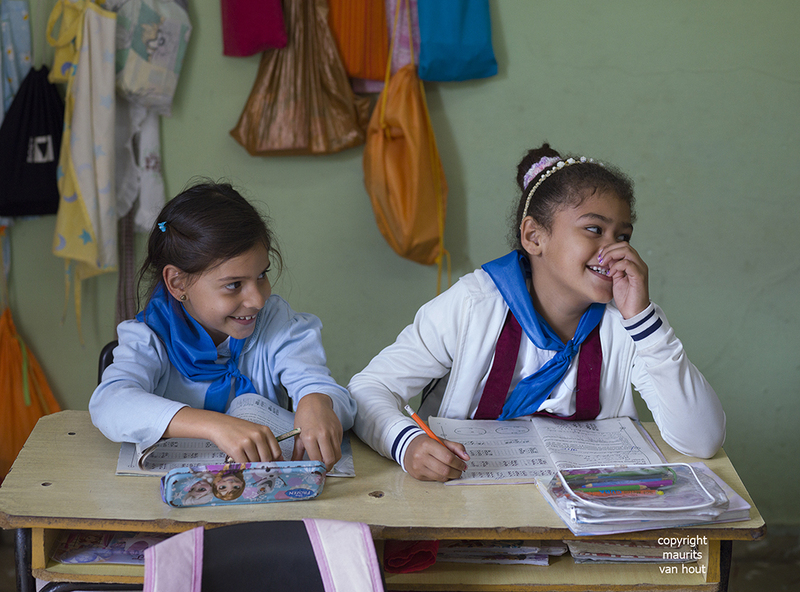 All Cubans have access to an education which is free of cost, from primary education up to and including university. Fidel Castro commented: ‘Without education, there is no freedom.’ Education creates chances and opportunities for people to live in freedom, summarized by the Cubans as: ‘Ser culto para ser libre’ (be a ‘sect’ in order to be free). In 1961, a mere three years after the victory of the revolution, Cuba was the first American country which was declared ‘free of illiteracy’. New-Zealand and twenty-seven other Latin-American and African countries learned or are learning to read and write with the Cuban literacy program Si, yo puedo. Education is very important in Cuba, despite the poverty. A High educational standard and an obligatory and free educational system from pre-school up to and including university. 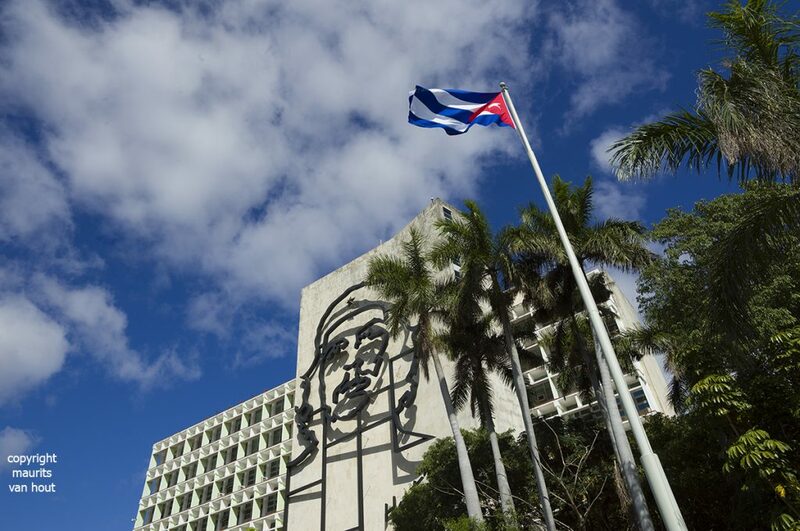 The ever present attention for Cuban history and the heroes of the revolution, the Spanish language, and art- and sports education all contribute to a highly successful system. I wonder why we travel to Scandinavia instead of Cuba to learn from the educational system. The Cuban educational system knows pre-school, circulo infantile, for children from one to six years old. Pre-school is not obligatory and focuses on the behavioural, intellectual and affective development. We visited a primary school in a village near Varadero. Both a pre-school as well as a primary school are present here. The secondary school is situated in a village nearby. The educational system in Cuba is subdivided in grades, with grades 1 up to and including 6 for primary education and grades 1 up to and including 9 for secondary education. Just as in The Netherlands, Cuba has a system of vocational schools after secondary education. After grade 9, a vocational education lasts four years. Starting after grade 12 is also an option. In that case, the vocational education consists of three years. Schools for higher education are open to everyone. Pre-university education consists of grades 10, 11 and 12. Exceptionally gifted students can be selected for special themes such as sports, science and arts. Cuba set the ambitious goal to be the most highly educated country in the world. One can choose for an education during the day, go to night school or pick from a wide array of freely accessible courses. After an evaluation of their pre-university education, students can be admitted to university. Acceptance through an entry exam is also a possibility. Does group size determine quality, after all? In primary education, the average group size is 13.5 students per teacher. In secondary education, group size is increased to 15. In university, the average group size is 20. Because of the national curriculum and the centralized examination, the educational standard is uniform and standardized. Practice and theory go hand in hand, so students gain work experience while they are still in school. All teachers have a university degree.Already in 1998, UNESCO pointed out the high educational standard in Cuba. In 2006, a review of skills in language, mathematics and science showed that Cuban students are still very much ahead of students in other countries, and in 2018, one sees and feels the Cuban pride in the educational system in all schools. Seen through our western eyes, it is remarkable that hardly any ICT applications are used in education. We did not come across any digital blackboards or iPads. This is entirely in line with the (lack of a) national ICT-infrastructure, and it showed us that teaching with a piece of chalk and without any group plans can also be of excellent quality. Special education in Cuba is subdivided into several levels and is differentiated into functions of the problem areas. Students go to a boarding or semi-boarding school. The system is very similar to the Dutch former ‘cluster education’. The internal facilities are of exceptional quality, which shows that not only the educational system but also the healthcare system in Cuba is of a high quality. 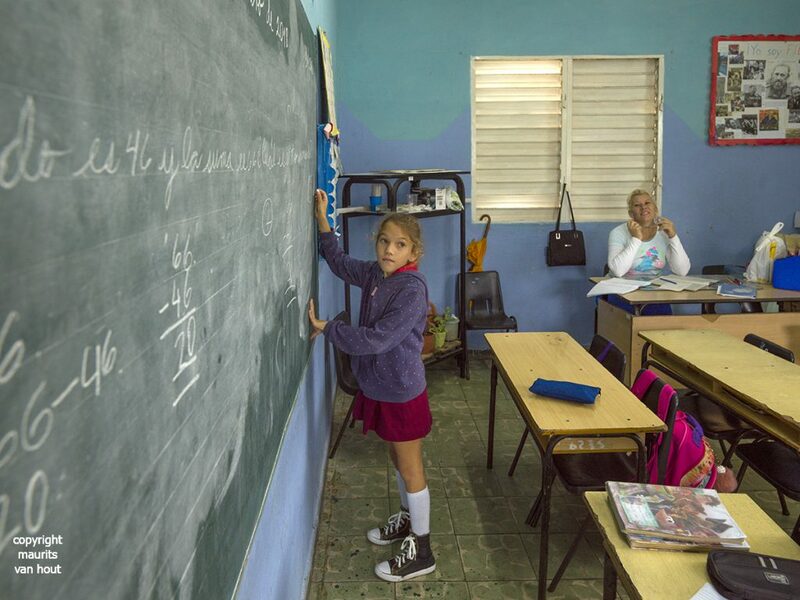 Because of all these facilities, school in Cuba is available to children who one will not, because of their disability, so often see in The Netherlands. This makes the system more inclusive than ours. The groups in the regular schools are smaller, resulting in less pressure of work for the teachers and better chances for children to remain in a regular school. Apart from that, there are a lot of places for children in special education. 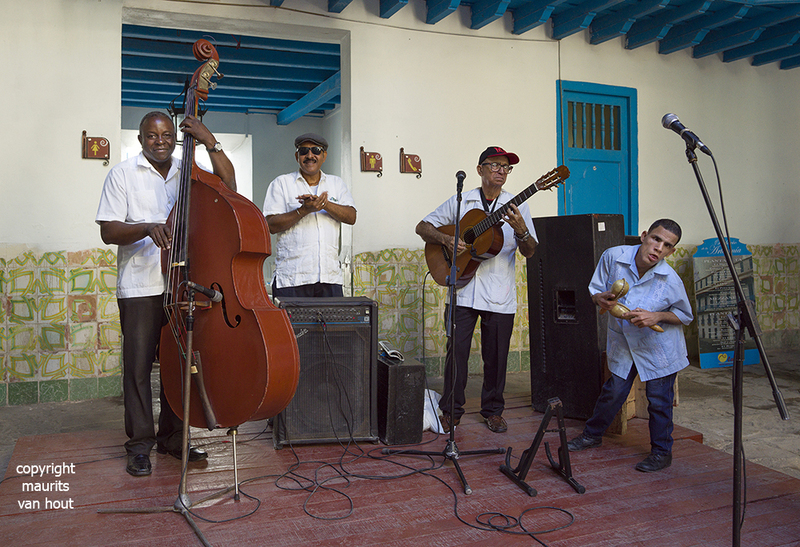 Cuba, Trinidad; schoolbusA remarkable fact is the recognition and development of different talents despite a disability. Special treatment programs exist, which are tailor-made for the specific disability and which are monitored by physical therapists and doctors. Here also, it is remarkable to see how small-scaled and individualized the facilities are. There is good reason to say that special education in Cuba is a significant accomplishment of the revolution! Cuba, Havana. 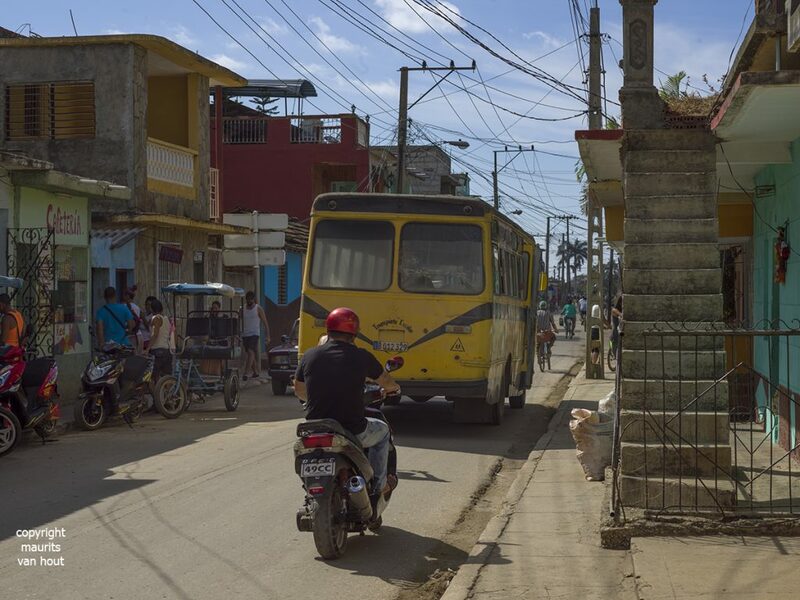 In Cuba doen mensen met een handicap gewoon mee in de maatschappij.